Seeking employment in a big company is never an easy task. Given the present global economic crisis, most people believe that it is better to keep your mouth shut and accept the term which has been offered to you, rather than going out of your way to ask questions and to clarify your doubts. However, not asking the right questions at the right time can land you in a fair bit of trouble in time to come. So when you are at an interview, you should use the time to clarify doubts and ask your future employer anything which you see fit to ask. 1. Where do you see the company going in about five years? Before you join the company, you should ensure that you know where things are going. You would not want to be associated with a company which is not likely to even be around for 5 years. It is very important to wait around for the right job to come about. Never simply accept any odd job which comes your way. Being associated, with a company that is going downhill, will not do you any good. This is because it is bound to look terrible on your resume. Making smart career-related decisions are very important indeed. One wrong move and your image could be tarnished forever. 2. What role do you see me playing in the company? At the very onset, it is important that you know what is expected of you when you are going to join a company. One of the worst things you can do is showing up confused and bewildered on your first day at work. Be sure that you are aware of the tasks that you are going to perform and once you are notified about the things expected of you then you can go home and prepare things and skills which you need to brush up on, in order to create a good impression. It is often said that the first impression is the last impression, so that is why from the very first day you should show that you are serious about the job. 3. What major project is the company presently working on? Once you are going to join the company, you should make it a point to ask your future employer about the project which the company is presently working on. When they bring you up to speed with things then you can start to think of some ideas and contributions which you can make to project. If you have a hands-on approach from the day which you join, then all the other employees will take you seriously and will really think of you as a force to be reckoned with. Listen with great attention to everything which is being told to you so that you get acquainted with things quickly. 4. What is the major challenge which the employees face? As a future employee of the company, you should know what you are getting into. You should not hesitate to ask your future employer about the problems and challenges which the employees face in general and the reasons; if at all they are unable to submit their work on time. Ask about whether the technology which is made use of just ordinary or top of the line? Making use of the right kind of tools and technology is bound to help the employees get their tasks done faster. So ask about the programs and apps which you will be making use of so that you can acquaint yourself with them. 5. How would you describe the work environment of the office? A very good question you should ask your future employer is about how the work environment of the office is. There is no one better to ask about the company’s work environment than the employer. You might think that this is not true as he is not in the thick of things, yet you ought to realize that he is aware of everything happening under his roof and all the problems are most likely to be brought to him to be handled. Ensure that the atmosphere is conducive to work and that all the employees function as a comprehensive unit rather than separate entities. 6. Do you micromanage the employees or leave them to their own devices? Various employees have various attitudes to approach their work. Some people like to be left to their own devices whereas others like to be guided along the way. In order to be sure what you are getting yourself into, you should ask your future employee whether he believes that micromanaging the employees produces better results or whether the employees being left alone is better for all concerned. Based on the answer which he gives, you can decide if you are okay with the way in which things are going to be. Rather than being discouraged later brace yourself for how things are going to be. 7. Does the company encourage or discourage workplace politics? There are some employees who like workplace politics and there are also some employees who think of workplace politics as something which is absolutely detestable and distracting. In order to know how things are at the company, ask your employer about whether the office endorses workplace politics or not. Some companies encourage such workplace politics as to some extent they believe that it is able to bring out the best in the employees and such competition is never a bad thing. You can decide on your own whether you would like to stay away from politics if you think that it is going to hinder your work. 8. What characteristics according to you make the ideal employee? 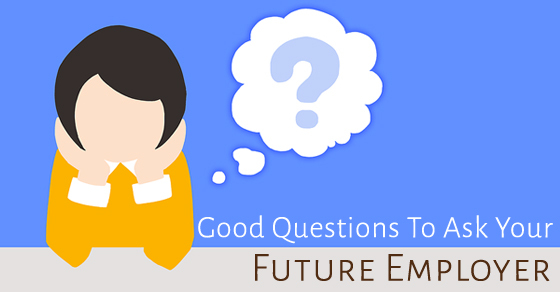 Asking this question to your future employee is very good as then you can be sure about the qualities which the employer is looking out for and in addition to this he will understand that you are someone who is eager to please the seniors and you will constantly willing to try your best at all times. Having this attitude is very positive and it shows that you are someone who is constantly trying to better yourself so that you prove to be a true asset to the company which hires you. Do your best to ensure that you are able to be a true inspiration to all. 9. Does the company encourage employees to think out of the box? You should ask this question to your future employer to know whether you are expected to go by the book and follow instructions to perfection or whether you are expected to apply the knowledge which you have and come up with novel and unconventional ideas. Each company has its own way of functioning. There are many companies which insist that it is either their way or the high way, so in order to avoid getting into any kind of trouble, acquaint yourself with the lines along which you are expected to think. 10. Are all the projects usually handled individually or in teams? Asking this question is very useful as then you can mentally prepare yourself accordingly. Some people prefer to work individually where as others prefer to work in teams, so accordingly to the answer given by the future employer you can start thinking about how you are going to function. No matter what answer is given; show that you are someone who is equally capable at doing both. You can work well with a team and you are also able to function independently on your own. Showing your versatility will help you a great deal and will also show that you know how to conduct yourself in a professional manner. 11. Who is it that I will be answerable to? Before you get into the thick of things, know who you are answerable to so that no one else tries to boss over you. If you hear things directly from the horse’s mouth then you will not be confused about who to approach when you need to submit your work or who you ought to ask when you have a doubt. There are many people in the company who are always willing to prey on the vulnerability of a new employee so ensure that you are not made a fool of. Asking this question will help you a great deal in time to come. 12. Is working from home an option? There are many companies which are okay with employees working from home, sometimes, because all they care about is whether the job is done or not. So inquire about this company allows this or not. 13. What challenges am I likely to face when filling this position? As mentioned above acquainting yourself with the role you are likely to play in the company will assist you along the way. Yet in addition to this a good question to ask your future employee is about the kind of challenges you are likely to face when you are filling this position. When you are aware of the challenges and problems then automatically you can be extra careful and have an eye out in order to avoid these things. Listening to the challenges, you need not feel worried, you just have to give your best at all times, no matter what. 14. Does the company offer some training to new employees? Asking such a question serves a dual purpose. First and foremost it allows you to know whether you will be starting with your job immediately or whether you will receive formal training initially. Secondly, when you ask such a question you silently communicate to your future employer that you are someone who is willing to learn new things and you constantly want to expand your knowledge as well as broaden your horizons. Asking the right questions will reflect the kind of person which you are. Companies always are on the lookout to employ such employees who are eager to learn about new advancements in the field. 15. What perks can I be expecting in addition to my salary? Money is something which is a very important part of our lives, without which you cannot have a decent standard of living. If you are sure about the salary which you are likely to receive then you can go on to inquire about the employee perks which you can be expecting in addition to the salary which you will be receiving. Ask about whether you will be getting travel allowance, health insurance and whether your family will be receiving these benefits too. 16. Which employees will I be in charge of? You should make it a point to ask your future employee about the team which you will be in charge of. Know this so that you can take charge of them right from the first day so as to ensure that they carry out their responsibility well. 17. When an employee’s idea does not work out, what stance does the company take at such a time? Lastly, ask about what position the company takes when an employee’s idea is not successful. Some companies encourage employees to take the plunge irrespective of the outcome, yet some companies have a much sterner outlook. So ask about this and decide about whether you would like to play it safe or take some risks. Right from the very onset, you should show that you are not someone who is shy from speaking their mind and that you have an analytical bend of mind. Asking questions is not a sign of weakness or stupidity rather it shows that you are rational and are able to think of things. Rather than having doubts clouding your mind and not allowing you to think clearly it is better that you just ask whatever you want to without feeling shy. Asking good questions will go a long way in ensuring that you are able to establish a very good reputation for yourself, right at the onset.